Brilliant Scottish actor Peter Capaldi is about to make his debut as the 12th incarnation of the namesake title character in the very long-running British show Doctor Who, which has its season premiere this weekend. 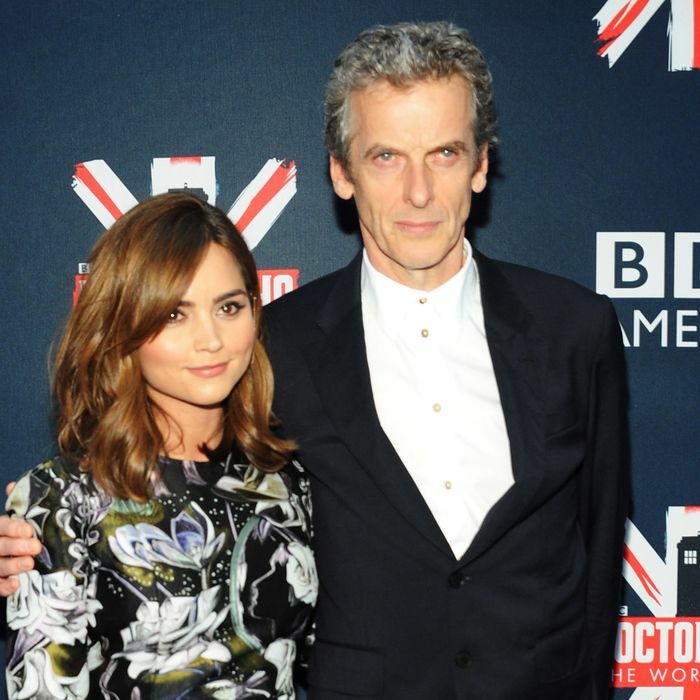 Last week when the show’s cast and writers were making the rounds, we had a moment to speak with Capaldi and Jenna Coleman, who plays continuing companion Clara Oswald. Grub also got a moment with venerated writer and producer Steven Moffat, and all three seemed absolutely delighted to hear that the show’s fandom has now taken root in the Dutchess County town of Beacon in the form of a full-on Doctor Who restaurant, officially making two places in the state that have TARDIS-themed interior decor. At the Pandorica, even the tablecloths are Police Call Box blue. Jenna Coleman smiled when we presented her with material from the Pandorica, which appears in the show as a subterranean prison beneath Stonehenge that’s designed to ensnare (of course) the Doctor. Pandorica the restaurant, however, opened earlier this month and serves batter-fried corn dogs and “Gallifryed” potatoes. At times, there have been lines out the door, thanks to specialty programming like sold-out cosplay events. “Hey, there’s a bar in Brooklyn, too, isn’t there?” Coleman asked, referencing the Way Station in Prospect Heights, where the entrance to the Doctor’s time machine transports you only to the bathroom. She flipped through photos of the TARDIS-meets-Van Gogh interior decor. “This is brilliant,” she said, in summary, adding she would order the “fish” fingers and custard. Like Coleman, producer and writer Steven Moffat said he was firmly into the idea — he wrote the original episode on which it’s based, after all. “Pandorica! This is great,” he said looking through the photos. “Fantastic! The Pandorica! I might have to go. “I might look conspicuous there,” he said, alluding to the general hazards of helming one of the most revered sci-fi series of all time in the age of Comic-Con.